(TORONTO) – Discriminating Canadian drivers seeking true luxury performance without compromise embrace the Lexus GS450h - the world’s only hybrid performance luxury sedan. The GS450h not only delivers a bold, dramatic look matched by its remarkable power, handling and fuel efficiency, it achieved top marks at the 2008 Targa Newfoundland rally and an incredible sixth place overall. The GS450h exemplifies the Lexus commitment to engineer high-performance luxury vehicles without compromise. The Lexus Hybrid Drive is fast yet efficient, uses less fuel to generate greater horsepower, and performs like a 4.5L V8 yet meets the toughest emissions standards. The GS 450h offers the security of standard active and passive safety features and technologies, such as: Vehicle Dynamics Integrated Management System (VDIM), Vehicle Stability Control (VSC), TRAC (Traction Control), Hill-Start Assist (HAC), and eight airbags. With an available Ultra Premium Package featuring a Mark Levinson Audio system, additional safety features and a DVD-based navigation system, the 2009 GS450h shatters conventional perceptions of luxury motoring. 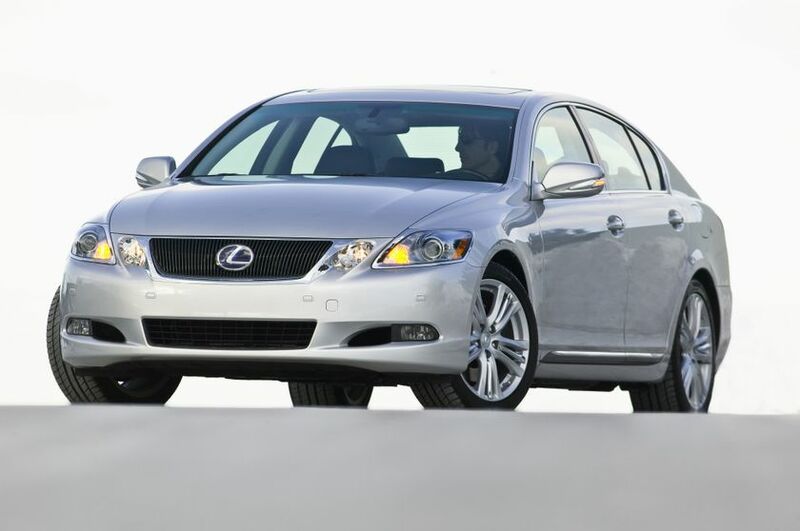 The 2009 Lexus GS450h is now on sale at Lexus dealers across Canada with a suggested retail price starting at $63,050. The Lexus GS450h hybrid performance luxury sedan delivers a truly inspired, next-generation driving experience built around the Lexus Hybrid Drive. This powertrain, specially engineered for the rear-wheel-drive GS450h, features a powerful yet efficient 3.5L V6 mated to a high-torque electric motor, a powerful storage battery, and a sophisticated energy management system. The system allows the gasoline engine and electric motor to work independently or together, switching seamlessly between modes as driving conditions demand. This Lexus Hybrid Drive fitted to the GS450h delivers performance on par with a 4.5L V8, fuel efficiency comparable to that of many 4-cylinder compact cars, and a significant reduction in smog-forming emissions compared to a conventionally-powered vehicle. The result is a vehicle capable of intelligent, effortless and exhilarating performance, that also features the refinement and elegance of a true luxury sedan. Whether it’s a winding road or the open highway, the GS450h boasts some big performance technologies. The state of the art Lexus Vehicle Dynamics Integrated Management (VDIM) system is standard fitted, as is Vehicle Stability Control (VSC) and Traction Control (TRAC), plus Hill Start Assist Control (HAC). Highly responsive variable gear ratio electric power steering is fitted to all models, improving drivability during rapid acceleration. The GS450h features an independent double-wishbone suspension up front, and multi-link control arm suspension at the rear, with stabilizer bars fitted to both. Handling and control is further enhanced with the Lexus Adaptive Variable Suspension system fitted front and rear. The 2009 Lexus GS450h seats five adults in comfort and style. But it also incorporates many active and passive safety systems to help protect them. In addition to VDIM, VSC, TRAC and other active handling and control design decisions, the GS450h features a tire-pressure monitoring system and a generous suite of braking systems. These include power assisted ventilated disc brakes at all four corners, enhanced with the Lexus Antilock Braking System (ABS), Brake Assist (BA) and Electronic Brake Force Distribution (EBD) as standard equipment. What’s more, the GS450h features an integrated Lexus Regenerative Braking system that captures kinetic energy that normally would be lost during deceleration, converting it to electricity to recharge the Lexus Hybrid Drive’s battery. Inside the GS450h hybrid performance luxury sedan, standard safety systems include dual-stage driver and front passenger airbags, driver and front passenger knee airbags, front seat mounted side airbags, and front and rear head/side curtain airbags. The GS450h may also be fitted with two additional airbags – rear seat side mounted. Three-point lap and shoulder seatbelts are fitted in all five passenger positions, and include adjustable “B” pillar shoulder belt anchors plus front and rear seatbelt pre-tensioners and force limiters. Younger passengers are protected with anchor points for child restraint seats and child protector rear door locks. And because safety is important even when a GS450h is parked, all models are also equipped with an anti-theft system, engine immobilizer, first aid kit and a tool kit. Buyers may personalize their 2009 Lexus GS450h hybrid performance luxury sedan on the Lexus of Canada web site (www.lexus.ca) or by visiting any Lexus Dealer across Canada. Buyers of any 2009 Lexus GS450h hybrid performance luxury sedan enjoy the peace of mind that comes with the industry-leading Lexus comprehensive warranty that covers the entire vehicle for four years/80,000 kilometres. Power train components are covered for six years/110,000 kilometres, hybrid related components are covered for eight years/160,000 kilometres, major emission control components are covered for eight years/130,000 kilometres and corrosion perforation for six years with unlimited distance. Service adjustments - minor repairs not usually associated with the replacement of parts - are fully covered for one year/32,000 kilometres, while Lexus owners also enjoy the Tire Road Hazard Protection warranty and access to alternate transportation. The four-year Lexus Roadside Assistance Program provides travel planning as well as the extra security and confidence of a dedicated toll-free telephone number and emergency service for towing - 24 hours a day, 365 days a year. The purchase of a new GS450h also includes free membership in Club Lexus, an online convenience service that places important vehicle ownership information at the guest’s fingertips. Audio: Satellite radio ready; in dash 6-disc CD changer; MP3/WMA audio capability; title display; Bluetooth capability; 10 speakers; steering wheel audio controls; glass imprinted antenna; satellite roof-mounted fin antenna. Includes: Mark Levinson Audio system featuring AM/FM/Cassette/Compact disc DVD auto-changer and 14 speakers; Rear seat side airbags; Clearance and back-up sensor; DVD-based navigation system with back-up camera; Rear spoiler. The Lexus Hybrid Drive is customized to each model. On the rear-wheel-drive GS450h, the Lexus Hybrid Drive features a 3.5 L V6 gasoline engine mated to a high-torque electric motor, a powerful storage battery, and a sophisticated energy management system. The system allows the gasoline engine and electric motor to work independently or together, switching seamlessly between modes as driving conditions demand. At startup and low speeds, when energy demand is low, the GS450h is powered by the electric motor. As speed increases, the gasoline engine kicks in. It also generates electricity to power the electric motor and charge the storage battery. During acceleration, the gasoline engine receives additional power from the electric motor, thus improving performance, saving fuel and reducing emissions. When slowing down or braking, the vehicle’s regenerative braking system uses kinetic energy to generate electricity and recharge the battery. With 339 horsepower, available across a broad band of engine speeds, plus up to 267 lb-ft of torque, the Lexus Hybrid Drive gives the GS450h plenty of power and impressive acceleration, on par with that of a 4.5L V8. A significant reduction in smog-forming emissions compared to a conventionally powered vehicle. Impressive fuel efficiency – equal to that of many 4-cylinder compact cars. Features: Aluminum alloy block; Dual overhead cams; 24 valves; Dual Variable Valve Timing with intelligence; Direct Injection System; Electronic Throttle Control System with intelligence (ETCS-i); Acoustic Control Induction System (ACIS); Stainless steel exhaust system; Dual exhaust. Emissions rating: Tier 2, Bin 3. Dual VVT-i is a Lexus engine system that independently varies the intake and exhaust valve timing on a continual basis to deliver optimal valve timing for a full range of driving conditions. It improves drivability, performance and fuel efficiency, and reduces emissions. Features: Sequential multi-mode shifter; Snow mode. Fuel efficiency: 8.7 L/100km city; 7.8 L/100km highway. The Continuously Variable Transmission - first envisioned and sketched by Leonardo DaVinci in 1490 - does away with a conventional transmission’s fixed number of gear combinations, producing instead an infinite number of effective gear ratios. This enables the vehicle to deliver the optimal performance for all driving conditions. The result is smoother, rapid acceleration without gearshift lag, maximum torque when required and improved fuel efficiency. The Lexus ECVT features dual-stage technology to multiply torque, resulting in even greater responsiveness. On this vehicle, the ECVT may also be operated in a manual-like manner, via a sequential multi-mode shifter. Vehicle Dynamics Integrated Management (VDIM) is the most sophisticated handling and control system Lexus offers. Specially tuned for each vehicle on which it’s fitted, VDIM uses information from computer-linked sensors to compare actual vehicle performance to driver commands. In this way, it’s able to anticipate potential vehicle stability problems such as a skid or slide. VDIM then makes subtle interventions through a combination of braking, throttle, and steering – in most cases, invisible to the driver – to maximize control. The Lexus Vehicle Stability Control (VSC) system is an active safety system that automatically helps to control a vehicle when it starts to slide – for example, when trying to turn at too high a speed. VSC compares driver braking and steering commands to the vehicle’s actual performance then activates individual brakes as needed and adjusts the throttle setting to help maintain stability and keep the vehicle on course. The Lexus Traction Control (TRAC) system helps the vehicle maintain traction when accelerating in slippery conditions. It also engages when the available grip differs from one side of the vehicle to the other, such as when two wheels are on a gravel or grass verge. When drive wheels begin to slip, TRAC automatically adjusts engine power to keep the wheels from losing traction. Hill Start Assist Control (HAC) system works to minimize back-rolling when stopped on an uphill grade. This suspension system allows the vehicle to raise or lower itself quickly, depending on need. For example, when the vehicle stops the chassis lowers two inches for easier loading an unloading. When driving at highway speeds the chassis lowers one inch at the front and one-half inch at the rear for improved stability; and when the vehicle’s four-wheel drive system is shifted into the low range, the vehicle rises three inches for better ground clearance. Regenerative Braking allows the high-torque electric motor in the Lexus Hybrid Drive system to act as a generator when coasting or braking. With this system, kinetic energy that normally would be lost during deceleration is captured and converted into electricity. This is then used to recharge the Lexus Hybrid Drive’s high-capacity storage battery, further increasing the system’s efficiency. Regenerative Braking is especially effective during stop-and-start city driving. The Lexus Antilock Braking System (ABS) uses sensors to monitor speed, traction, vehicle load and the driver’s applied brake force. The ABS then controls brake applications to minimize wheel lock-up, reducing the chance of the vehicle skidding. The result is shorter stopping distances on wet, gravel-covered, sandy or other surfaces where traction is questionable. The Lexus Brake Assist (BA) system is a system designed to assist the driver during emergency braking by supplementing the braking power applied if the driver has not pushed hard enough on the pedal in an emergency braking situation. It works in conjunction with ABS to minimize lock-up during emergency situations. The Lexus Electronic Brake Force Distribution (EBD) system minimizes stopping distances by maximizing the braking power applied to those wheels that have the best grip. This system also automatically adjusts the fore/aft brake balance according to vehicle load, and the right/left brake balance if brakes are applied during cornering. Powered by a Xenon gas bulb, these projector-beam HID headlamps use less power, last significantly longer and provide considerably more illumination than halogen bulbs. The Lexus Adaptive Front Lighting System pivots the driver-side headlamp up to 15 degrees to the left and the passenger-side headlamp up to five degrees to the right to help illuminate the road through turns. For safer night driving, the Lexus Auto Levelling Headlamp System adjusts the lights to a pre-set height. This allows for better road illumination without blinding oncoming traffic.